How Much Bleach to Put in a Spray Bottle to Sanitize? Chlorine bleach has long been used to clean and sanitize around the house. From cutting boards to garbage cans, chlorine bleach is the go-to product to get rid of germs and bacteria. Mix up a chlorine bleach solution into a spray bottle and use it in various places around your home to disinfect. Bleach sanitizing spray is inexpensive and easy to make. Household bleach kills 99.9 percent of viruses, germs, bacteria and certain types of mold. The active ingredient in bleach, sodium hypochlorite, is mixed with water to create this powerful and effective disinfectant. Household bleach is not a contaminate to the ground water, and it does not pose a danger to the environment. In fact, most of the bleach breaks down before it reaches sewage treatment. Begin with a clean, empty 32 oz. spray bottle. Make sure there are no traces of other cleaning products in the bottle. Put ¾ tsp. of household bleach into the bottle. Fill the bottle up with room-temperature water. Put the lid on and shake up the bottle well. A general rule for sanitizing with bleach is to use 1 tbsp. of household bleach for every one gallon of water. Using hot or cold water can minimize the effectiveness of the bleach mixture. Instead, use room-temperature water to keep chlorine loss to a minimum. Discard the contents of the spray bottle at the end of the day once sanitizing is done; bleach loses its effectiveness when it sits for too long. Your sanitizing bleach spray can be used on a variety of surfaces around the home. It works best if the surface is cleaned and rinsed well prior to sanitizing with bleach. 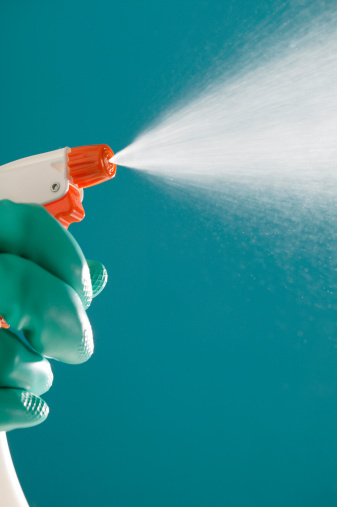 Spray the sanitizing spray onto the surface you wish to disinfect. Let it sit for a minute or two, then wipe it off with a dry rag. Use the bleach spray on a variety of hard surfaces around the home, including countertops, bathtubs, toilets, sinks, cutting boards, appliances, floors, garbage cans, kids high chairs and potty seats, walls, light switches and doorknobs. Bleach is a harsh product, and must be used with caution. Always wear rubber gloves and work in a well-ventilated area. Keep bleach out of reach of children and away from pets. Bleach should never be mixed with other cleaning products. Toxic gases may be released that can cause severe adverse health effects. Always dilute bleach with water before using. Bleach will alter the color or damage some surfaces. Before spraying the sanitizing spray on any surface, test a small area with the bleach mixture to check for any color changes or damage.